but then I started planning out my week and it came to me, so now I am here to share it with you. It seems like any other winter day in Montgomery, Alabama. Mama and child are riding where they're supposed to way in the back of the bus. The boy passes the time by watching his marble roll up and down the aisle with the motion of the bus, until from way up front a big commotion breaks out. He cant see what's going on, but he can see the policeman arrive outside and he can see Mamas chin grow strong. "There you go, Rosa Parks, she says, stirrin' up a nest of hornets. Tomorrow all this'll be forgot." But they both know differently. 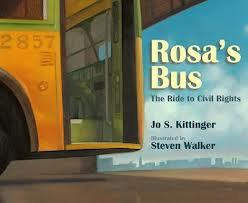 With childlike words and powerful illustrations, Aaron Reynolds and Coretta Scott King medalist Floyd Cooper recount Rosa Parks' act of defiance through the eyes of a child, who will never forget. The story of the bus--and the passengers who changed history. Like all buses in Montgomery, Alabama, in the 1950s, bus #2857 was segregated: white passengers sat in the front and black passengers sat in the back. Bus #2857 was an ordinary public bus until a woman named Rosa Parks, who had just put in a long day as a seamstress, refused to give up her seat to a white passenger. Her arrest sparked the Montgomery Bus Boycott, a major event in the Civil Rights moment, led by a young minister named Dr. Martin Luther King, Jr. For 382 days, black passengers chose to walk rather than ride the buses in Montgomery. 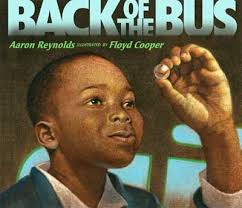 From the streets of Montgomery to its present home in the Henry Ford Museum, here is the remarkable story, a recipient of the Crystal Kite Award, of a bus and the passengers who changed history. We will be talking about the actual events and comparing the stories and how different points of view can present different information or perspectives. This is what I will display in my class (it is made with my Reading Goals Chart editable pages) and the checklist I will have for students. You can download these for free here. I will be working on providing students with a framework to answer questions on point of view to get us started. Here is the framework I will use at the beginning of our unit (pretty basic but we will build upon it until we can answer with evidence and our own ideas independently). Click here for a copy. Thanks so much for this post! 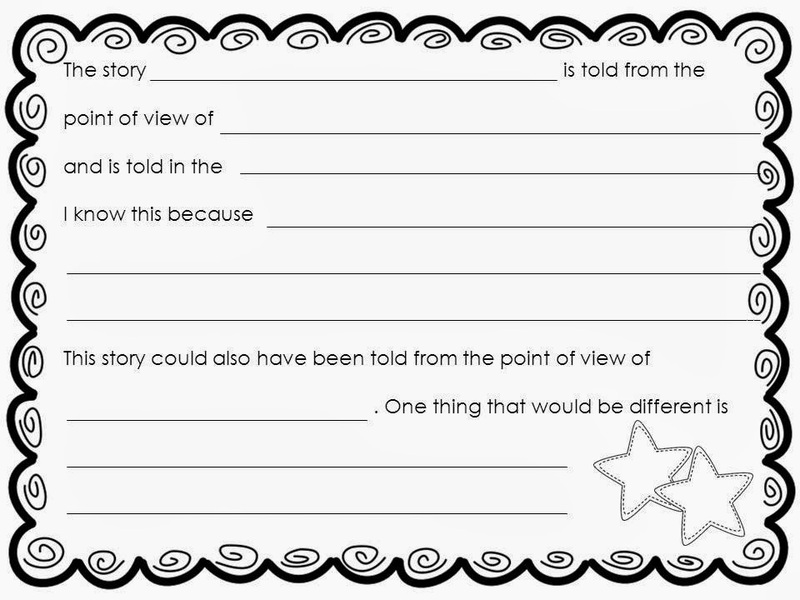 We are learning about point of view right now and these activities will really help the students and their writing skills. Thanks for sharing your ideas about 'point of view'. I'll be having similar discussions with my first graders! Now I have to get Back of the Bus...that is two of you lovely teachers suggesting it! Thanks for this post! I think that I can for sure use this once I locate those books for my classroom. Teaching POV can be tricky, and I love the idea of using these books to help out! Can't wait to hear how it goes!!! I love the writing frame and lesson idea, AMC. This is the first time I've visited your blog...cute! I shared The Buffalo Storm, a book I just picked up about the Westward Expansion. Since I'm a reading specialist, I am always looking for reading materials teaching something in a new way. I'll add your POV frame to my collection. Thanks again! These look like great books for teaching point of view. Thanks for the freebies. They look wonderful.